Chapter 1 now begins with a short section giving an overview of data. Toward Statistical Inference (previously Section 3.3), which introduces the concepts of statistical inference and sampling distributions has been moved to Section 5.1 to better assist with the transition from a single data set to sampling distributions. Coverage of mosaic plots as a visual tool for relationships between two categorical variables has been added to Chapters 2 and 9. Chapter 3 now begins with a short section giving a basic overview of data sources. Coverage of equivalence testing has been added to Chapter 7. Greater emphasis on sample size determination using software in Chapters 7 and 8. Resampling and bootstrapping are now introduced in Chapter 7 rather than Chapter 6. “Inference for Categorical Data” is the new title for Chapter 9, which includes goodness of fit as well as inference for two-way tables. Exercises and Examples Over 30% of the 1700 exercises are new or revised, and over 30% of the 430 examples are new or revised. LaunchPad, our online course space, combines an interactive e-Book with high-quality multimedia content and ready-made assessment options, including LearningCurve adaptive quizzing and coded machine-gradable exercises from the textbook. Content is easy to assign or adapt with your own material, such as readings, videos, quizzes, discussion groups, and more. LaunchPad also provides access to a Gradebook that offers a window into your students' performance—either individually or as a whole. Use LaunchPad on its own or integrate it with your school’s learning management system so your class is always on the same page. 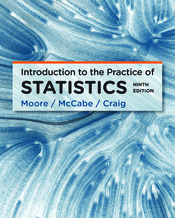 To learn more about LaunchPad for Introduction to the Practice of Statistics, Ninth Edition, or to request access, go to launchpadworks.com.